Divine Matrix is Steve Barnes, the man who gave us New Day in 2009. But contrary to New Day, Invisible Landscapes is a beautiful intrusion in a rich and varied musical world where Steve Barnes always so melodious approach is freezing into music at once complex, dark, electronic, electro-acoustic and esoteric. As describes so well in his guide of press, Steve Barnes exploits to the hilt the immense possibilities nowadays of equipments and technologies to weave a highly diversified album. An album which at first hearing could sounds simplistic or very New Age, but which in the course of listening spread an astonishing originality that doesn’t alter all of its musicality. Chronicle of an album divided between harmonies and artistic quests. Faith in Chaos begins like a musical poetry with delicate and light arpeggios which twirls around as in Snowflakes are Dancing. It’s a nice oniric sequence which spins in spiral and stumbles on a pleasant piano of which notes are hanging on to a soft and silky electronic ballad filled of fine crystalline arpeggios. In fineness and subtlety, Faith in Chaos’ rhythm evolves on a more lively structure where the musicality of its introduction goes into more slamming percussions, very romantic piano spirals as well as synths with layers and solos which are entwining in a soft harmonious echo. 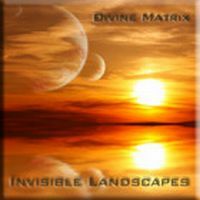 This musical limpidity pours towards the title track, Invisible Landscapes, which shows a bit more dramatic intro with its layers of synth sounding like quavering flutes which breeze on a hesitating piano. Notes of acoustic guitar float in a cosmic drizzle, giving the necessary respite so that the piano resumes its rhythmic impetus and mould a melody that we seem to already hear on Faith in Chaos. Fractured Sound pursues this enchanting introductory quest to Steve Barnes 2nd work with static voices that seem to wander between two worlds. It’s quite a creepy intro which finds basis on stabling dark synth layers which criss-cross a fine pulsating line. Melancholic notes from a delicate piano emerge out of this ambiance to waltz around these long oscillatory curves, crawling as glaucous spectres on a rhythmic which becomes heavier. We would believe being in the darker universe of Memory Geist. Always, piano notes gush and are isolating to draw up a nice melody which is stretching on The Crystal Womb where piano notes get tangled in a childish nursery rhyme forged in chords of glasses. It’s a beautiful melodious and melancholic fusion which results in a slightly lively rhythmic and a soft passage with violin of China. And so will unroll Invisible Landscapes. Every track seems to be moulded in its precedent or following one, in a point such as we have the vague impression to hear the same melody on subtle variations structures. So Orna’s Prayer, Stargazer, The Fade and Space Walk have all this delicate approach where the piano prevails lazily on structures which slowly liven up of fluid rhythms but not really strong. Terraforming respects this path but without passing by a melodious piano approach. Arpeggios which are succeeding nervously and jolting on Occam’s Razor intro make of this track one of the highlights of Invisible Landscapes. We are in Low’s Bowie era with a nervous minimalist structure which tinkles on an abstract tempo. Synth layers are superbly suave and the hypnotic rotary circle of Occam’s Razor is absolutely fascinating beneath its sky of gaily-coloured eclectic sound effects. It’s a very good musical piece, quite as Whistle the Moon which goes into an electro-acoustic kind that could have been some of the best moments of Fax label and Skyrapper which offers some Memory Geist reminiscences. Song for Vega is a heavy meditative circular movement where chords turn around synth layers filled by spirits of old and dark organs’ tones. It’s a track as much sombre and effective as Fractured Sound but more melodious and which flows on a ceaseless stream of gleaming synth. It took me some listening but I eventually learn to appreciated this style so unique to Steve Barnes where New Age is so near while being so far with these soft melodies which flow on structures at once harmonious and electronic but sometimes complex and occasionally dark. With its13 tracks which cross the road of an enormous musical variety, Invisible Landscapes is a surprising collection where variables styles overlap in a delicate harmonious freedom. Even if we always have this vague impression of hearing the same melodious structures, they always end by getting lost and sink at the whim of ambiances and atmospheres just as much diversified. Beautiful, sometimes poetic but constantly harmonious, Invisible Landscapes is the ideal opus to furnish the ambiances when we are in agreeable company.